Broccoli is one of those vegetables that will actually last a while when stored properly; if refrigerated when fresh, broccoli can stay for up to 2 weeks. But if you accidentally bought too much, or you're taking advantage of the season with farmer's market broccoli, or perhaps you're growing this vegetable in your own garden, you might need to freeze the surplus. Luckily, broccoli freezes well, and if you follow either of the two methods of blanching beforehand, you will be left with ready-to-cook, vibrant crowns, perfect for a busy weeknight. Although it is simpler to just toss the vegetable in a zip-top bag and throw in the freezer, blanching them first results in a fresher tasting, better looking, and more nutritious broccoli. By quickly cooking and then stopping the cooking (which is what blanching is), enzyme actions that would cause flavor, color, and texture loss are ceased. Blanching also brightens the vegetable's color and slows down the leaching of vitamins. Before you can blanch the stalks, you need to follow a step or two. To prepare the broccoli, cut off and discard the tough, woody stalks. Alternatively, you can use a vegetable peeler to scrape off the tough outer skin on the stalks and simply trim off the bottoms. Then, soak the broccoli in cold, salted water for about 30 minutes. This will remove any insects that might be present. Swish it around to remove the dirt and rinse well with cold water. Remove and cut the broccoli into uniform stalks or pieces so they will cook evenly. Fill a clean sink or a large container with ice and water. The ice water will be used to cool the broccoli quickly after it has been blanched. There are two ways to blanch vegetables: boiling and steaming. If you choose to boil, you need to bring a large, deep pot of water to a full rolling boil. Working with about 1 pound of broccoli at a time, immerse the vegetables in the boiling water. Blanch for 3 minutes. Begin timing as soon as the water returns to a boil. If you are going to steam blanch, then you will need a pot as well as a basket insert that fits snugly inside. Put about 2 to 3 inches of water in a large, deep, heavy pot. Bring to a boil over high heat. Working with about 1 pound of broccoli at a time, put the prepared pieces in a wire basket or steaming basket insert. Place it over the pan of boiling water, cover the pan, and begin timing. Steam for 5 minutes. Once the broccoli has blanched for the allotted time, immediately immerse the broccoli in the ice water and swish it around to cool quickly. Once cool, remove and drain well. Now the broccoli is ready to be packed up and frozen. Place in wide-mouth jars or freezer containers leaving about 1 inch of headspace. Or you can store the broccoli in zip-close freezer bags (no headspace required). Label with the name and date before placing the containers in the freezer. One pound of broccoli will yield about 1 pint frozen. Blanched frozen broccoli is a snap to prepare because it has been pre-cooked. All you need to do is place it in a saucepan with about an inch of water, cover, and boil briefly just until tender. You can also stir-fry the broccoli in a little butter or extra virgin olive oil just until tender. 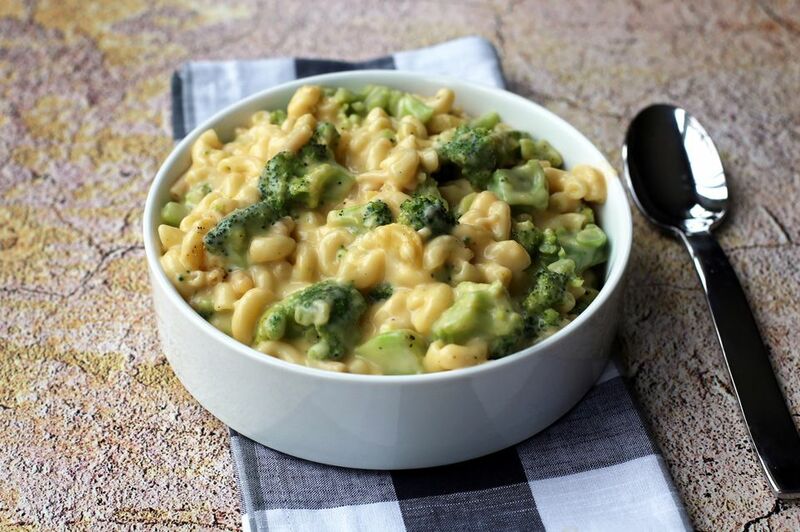 Frozen, blanched broccoli is perfect to use in recipes that call for cooked broccoli, such as easy broccoli with cheese sauce, broccoli and cauliflower casserole, and broccoli cheese casserole.